Silver Bear, .45 ACP, FMJ, 230 Grain, 300 Rounds is rated 4.7 out of 5 by 13. 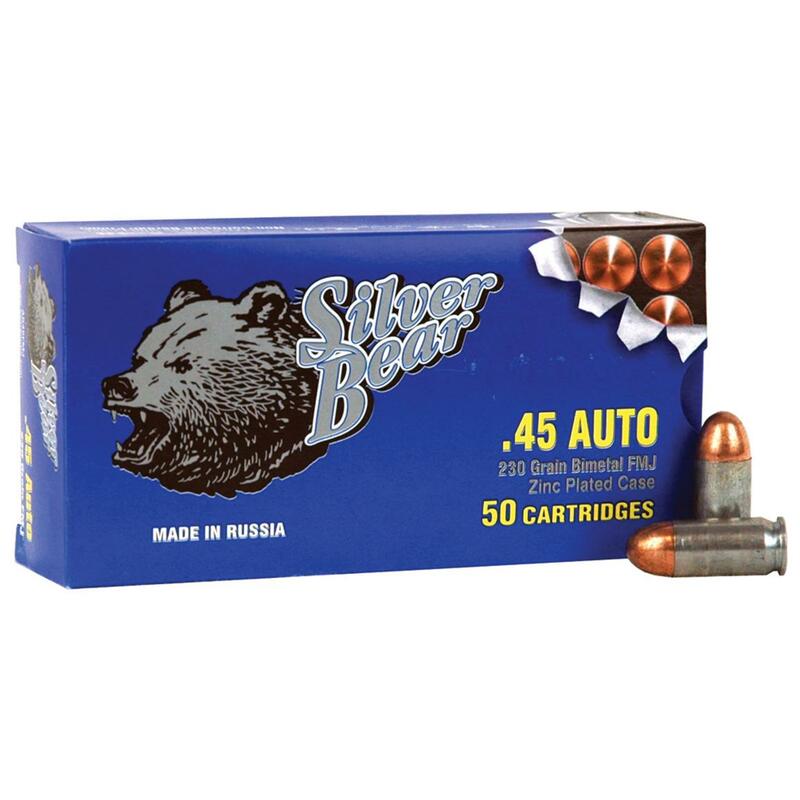 Rated 5 out of 5 by Michael from Silver Bear Russian Ammo Good ammunition. Always on target. Rated 5 out of 5 by NNMRA from Smokin deal These never fail. Rated 5 out of 5 by Thomas from SAME EVERY TIME. Same every time . I order from Sportsman's Guide. I get the right order and I get it fast . Sometimes wiith free shipping. That just makes it more better ! . Even when you do pay shipping, most of the time your going to save some bucks shopping at SG. O, the ammo shoots real good and the price is right . Will be buy n some more Im sure. Thanks. T.J.Mc. Rated 5 out of 5 by Andrew from Shot a whole box.No misfires.Great plinking ammo.Great price. Rated 5 out of 5 by SideYardShooter from Great Ammo Off a rest with my 1911 Para, this ammo was good for 2" groups or better at 15 yards, and I have had no FTF or FTE shooting a couple hundred rounds. It's a bit dirty, but the price makes it worth it. Perfect for plinking and practice. Rated 4 out of 5 by Joseph from IT is what it is. Cheap, unreloadable ammo. Works fine for target shooting. My chrony shows low of 783 to a hi of 810 fps out of a 5'' 1911. Rated 5 out of 5 by JOE from great price for the ammo...never had any problems with any ammo or any product I've ever bought from Sportsman's Guide!